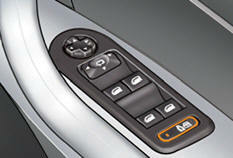 The control is located on the driver's door, with the electric window controls. The indicator lamp on the button comes on, accompanied by a message in the multifunction screen. The indicator lamp on the button switches off, accompanied by a message in the multifunction screen.